Co-supervision arrangements for graduate researchers provide exciting opportunities for private and public organisations to work together and gain access to new expertise, facilities and funding whilst also supporting the next generation of research students. "For 160 years, Museum Victoria has developed its vast collections that represent unparalleled evidence for research on the evolution of our planet and its inhabitants—including us. We maintain some of the largest and most significant collections in the Southern Hemisphere", said Dr Erich Fitzgerald, Senior Curator of Vertebrate Palaeontology. Dr Alistair Evans, Research Fellow at the Monash School of Biological Sciences, identifies a number of synergies that result from the partnership between Monash and MV. "Museum staff, both in both curatorial and collections management, often have a different skill set and knowledge base to university-based academics, and engagement between Monash and MV allows the best of these two aspects to be combined. Museum Victoria can be a Partner Institution for ARC grants, and so can be a valuable partner in Linkage Projects. Public outreach is a key goal of MV, and MV resources and the expertise of MV staff assist in publicising and educating the general public about joint projects", he said. From a student perspective, having supervisors from both institutions can greatly enhance the graduate research experience. 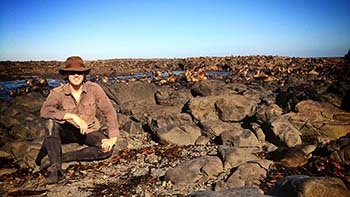 David Hocking's PhD project, which is co-supervised by Dr Fitzgerald and Dr Evans, examines the foraging ecology of pinnipeds (seals, sea lions and walrus). He says co-supervision has enabled an interdisciplinary research approach and provided access to rare specimens and valuable professional networks. "As well as providing access to the collections, collaboration with the museum has also allowed me to interact and work with museum staff and visiting scientists. This has given me access to a great source of advice and new ideas, both about my own research and in exposing me to work being done by other researchers from all over the world", said David. David also regards collaboration with MV as enhancing his postdoctoral opportunities. "As well as working on my PhD research, my collaboration with the museum has also led to opportunities to be involved in other aspects of the Museum's activities, including public outreach and education. Being able to demonstrate a diverse range of experiences is important when applying for Post Docs or when looking for work outside academia, so the opportunities provided by collaboration with MV may prove invaluable in my future after I complete my PhD", he said. Dr Fitzgerald said the partnership between the two institutions was mutually beneficial and that Monash students made an important contribution to the work of Museum Victoria. "I have been consistently impressed by the standard of Monash students I have had the pleasure of working with. They bring a real professionalism to the way they do things", he said. Authorised by: Chief Marketing Officer, Strategic Marketing and Communications. Maintained by: Graduate Research web team. Last updated: Dec 2017.